Ah...you have to look at the larger image to see the figures about to enter the door of the tree. I am intrigued by the tendrils of green that twist around the roots. They look like hair coming from the top of the tree which appears to be way up in the clouds. I like this...it's an entrancing fantasy piece. wow! this looks great! 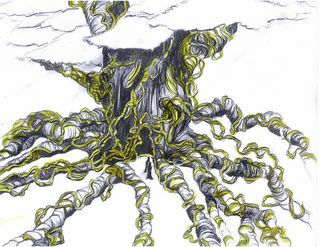 i love the windy roots and twisted vines - you have a great talent. Nice work...it looks like it was fun to draw. Thanks all, yes Julie, it was.